Nearly one-third of the global disease burden stems from surgically treatable conditions. And while many global health initiatives focus on primary and preventative care, five billion people around the world still lack access to basic surgical services. Rooted in the tradition of Catholic social justice and a spirituality of solidarity, Solidarity Bridge seeks to respond to this concrete reality. We work in partnership with the medical communities of Bolivia to increase access to safe, essential, and timely surgical care. With our partners, we operate four year-round surgical programs. Through short-term medical mission trips, we connect US medical practitioners to their peers in Bolivia. Together, we are building a healthier future. In a spirit of mutuality, we build a healthier future for the people of Bolivia and Paraguay through domestic and international partnerships. We train and equip their medical communities, empowering them to provide high-complexity surgery and other health care for those living in poverty. We transform lives by promoting solidarity and justice through experiences of service and healing. We believe that saving a life and alleviating suffering can sustain families and strengthen communities. We advocate for justice by creating a bridge of solidarity between North and South America. We give priority to serving those living in poverty. We welcome participants, partners, and patients regardless of religion, race, ethnicity, sexual orientation, gender, or age. We are rooted in the Catholic faith and its tradition of social justice. We learn from those we serve and gain perspective on the inequities in the human family. Partnership is a key element of our mission. we refer to each of the diverse individuals and organizations who contribute to our common mission as partners. We have many partners in this mission, but our closest partner, our sister organization in Bolivia, is Puente de Solidaridad. Puente de Solidaridad opened its doors in 2005 to manage our programs and day-to-day operations in Bolivia locally. It is now a legally and financially independent nonprofit, and though we are two distinct organizations, neither of us could succeed without the other. Puente de Solidaridad is headquartered in Cochabamba. 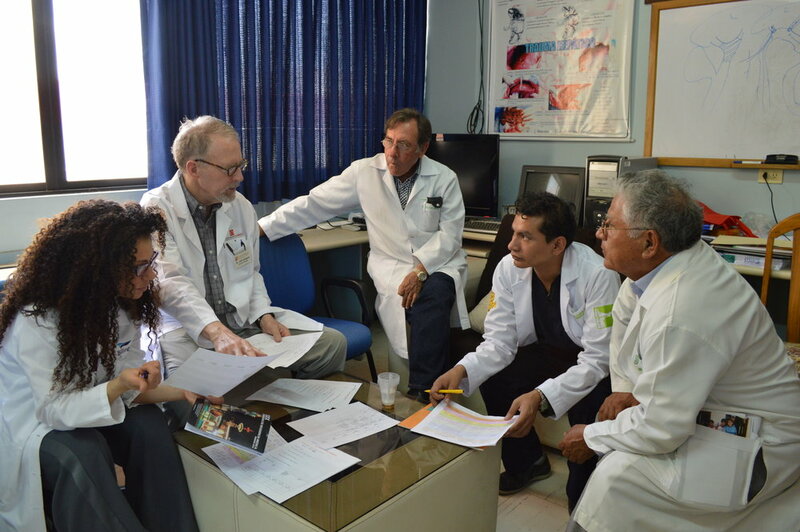 It plays a critical role in nurturing our relationships with partner hospitals and doctors throughout Bolivia. In addition to this work, it employs social workers responsible for screening our surgical patients for financial eligibility and for overseeing follow-up care for those who require it, including all pacemaker implant recipients. Puente de Solidaridad manages a supply warehouse that catalogs, stores, and distributes our in-kind donations ranging from high-value surgical instrument trays to gauze and suture supplies, both for mission trips and year-round activities. We are deeply grateful for their commitment to our mission. Together, we harness the energy, skills, and compassion of highly specialized medical practitioners in the United States who join Bolivian specialists in valued relationships of professional service and training. In the United States, partner hospitals and health care systems can support Solidarity Bridge through medical supply donations, missioner recruitment, financial support, and more. In Bolivia, we have formal agreements with more than a dozen partner hospitals to host medical missions and campaigns or to collaborate in providing year-round operations through our four surgical programs. In Bolivia, our partner physicians are surgeons, anesthesiologists, and other doctors who receive training and equipment from Solidarity Bridge and provide surgeries for patients throughout the year, while also passing along acquired skills and knowledge to their students and peers. In the United States, we call our partner physicians missioners. These are medical mission trip volunteers, highly specialized medical practitioners who travel with us on short-term mission trips to work alongside their Bolivian peers in our common endeavor to bring surgery and medical care to the underserved. Learn more about becoming a missioner. Medical organizations, foundations, and corporations throughout the world help make our work possible through in-kind and financial donations. The following are some of our major corporate partners. Contact Rachel to learn how you can become a partner in our mission. Years ago, our mission teams observed the connection between poverty and poor health in Bolivia. Solidarity Bridge championed efforts to improve economic conditions by facilitating the establishment of fair trade partnerships between US businesses and Bolivian artisans who would benefit from expanded markets for their products. Fair trade practices honor the cultural heritage of artisans by respecting their craftsmanship and paying living wages, while also supporting locally sourced, low-impact, or recycled materials. Today our partners at Puente de Solidaridad manage exports from Bolivian cooperatives to vendors in the US. Read more about our fair trade partners, Dharma Trading Co.
Solidarity Bridge prides itself on seeking the highest levels of accountability, and is a Guidestar Platinum Accredited Charity. We invite you to get further acquainted with our Staff, Board of Directors, and our Professional Advisory Board. See complete lists of all U.S. Staff and board members. Select a board or staff member's image to view their bio. A reference group of physicians and nurses across various medical specialties. Members of our PAB are ambassadors for Solidarity Bridge who assist us with medical consultation, procurement of medicines/supplies/equipment, and bringing more people into our mission effort. Solidarity Bridge began in 1999. Our founder, Juan Lorenzo Hinojosa, launched the organization out of a deep desire to connect with and serve people in need, and to do so through the embodiment of solidarity. These values have shaped our work throughout the years, and still guide us in our mission today. Read more of our founding story.